Description: C&O shrouded several of these Hudsons following the War for crack passenger trains. John inspects the running gear. By this time, I was out of high school and had joined the ranks of the employed, and missed this trip. Description: The shrouded Hudson lays back while the 611-not THAT 611, but this one is just as interesting-takes center stage while John takes a rest. Description: Late day view of 2 classics! Description: Slick as a bullet. Description: C&O 490 with C&O consist. This locomotive is now parked inside. Description: A rare example of streamlined steam locomotive. Description: Old streamlined C&O Hudson. Description: C&O streamlined 4-6-4, built to look like the turbine used on the "Chessie" streamlined train. There were 4 of these engines built to handle the Chessie's connecting trains. Description: A little faded with the years, but a stunning life-sized mural of Columbus (OH) Union Station in its heyday. Mural is located just north of the long-demolished station (1972) on North High Street. Title: CO 490 Anything unusual? Description: Big, unique, and impressive C&O steam is on display at the B&O museum. 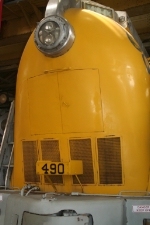 490 is the sole surviver of only four streamlined Hudson type (4-6-4) locomotives owned by the Chesapeake & Ohio Railroad. It was rebuilt by the C&O in 1946 from a Pacific type (4-6-2) locomotive. The original Pacific was built by the Richmond division of the American Locomotive Company (ALCO) in 1926. 490 was donated to the Baltimore & Ohio Museum in Baltimore, MD in 1971 from the C&O Historical Collection. 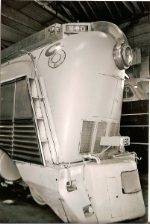 It is also the only surviving streamlined (shrouded) Hudson. Description: This thing is huge and bunched together with other locomotives I can only get a picture of the front at the B@O railroad Museum.